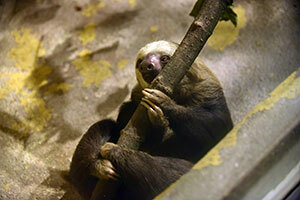 The Milwaukee County Zoo is excited to welcome 1-year-old Fezzik, a two-toed sloth, from the Topeka Zoological Park. It is the first sloth at the Zoo since 2013. Fezzik is on exhibit in the Small Mammals building in the former River Otter Exhibit. Although sloths get their name from their leisurely demeanor, they can actually move quite quickly when they are escaping a predator. Sloths spend nearly all their time motionless and suspended in trees, aided by their powerful grip and long claws. They are so inactive that algae grows on their coats, giving them a greenish tint that helps camouflage them. Fezzik is on exhibit daily in the Small Mammals building. Check back soon to learn more about him!